According to an Oxford University study, involving mice, roasted peanuts are more likely to trigger an allergic reaction than raw peanuts. Scientists say chemical changes caused by dry roasting processes may prime the body’s immune system – sparking future allergic reactions. However, much more work is needed before humans should consider swapping roasted nuts for raw ones, they say. The research appears in the Journal of Allergy and Clinical Immunology. Mice were exposed to peanut proteins through the skin or the stomach. Animals given the dry roasted samples had a much stronger immune response – the body’s way of fighting things that appear foreign to it – than mice given the raw versions. In humans, immune responses vary. Some can be mild, causing rashes for example, but others can be extremely dangerous, leading to swelling of the mouth and breathing difficulties. Scientists say it is likely to be the high temperatures used to roast nuts that are responsible for the chemical changes that, in turn, prompt the allergic reactions. 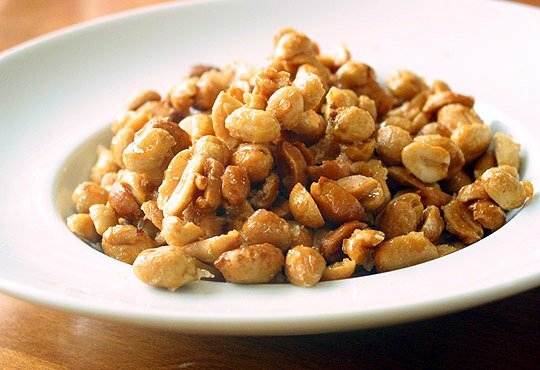 And researchers believe the findings may explain the lower allergy rates in East Asian populations where boiled, raw or fried nuts are a more common part of the diet than roasted ones. However, they warn that much more work is needed before doctors make any specific dietary recommendations. Prof. Quentin Sattentau said: “We know that children in families with other allergies are more likely to develop peanut allergy. Scientists are now exploring methods to get rid of the particular chemical changes that may be responsible for kick-starting the immune system. People with peanut allergies are advised to avoid them and many carry auto-injector pens to reduce the severity of any reactions that do occur.